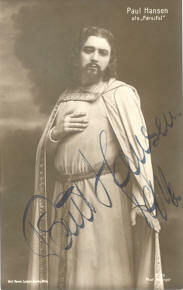 The Danish opera singer and actor Paul Hansen made his stage debut in 1908 in Copenhagen in "Lida Kirsten". He eventually went to Berlin where he got a training as a baritone. He asserted as a successful singer in the following years who took on roles as a tenor as well as a baritone. Paul Hansen made his film debut in 1917 with "Cavalleria Rusticana" (17), it followed "Reichsgräfing Gisela" (18). He soon was successful too as a movie actor, and his movie "Die Herrin der Welt" (19) was one of the most popular movies of that year at the same time. He continued his film career in the 20's and took part in "Der Spielmann" (21), "Die Jagd nach dem Tode" (21), "Tiefland" (22) and "Gräfin Donelli" (24).